I love how fully this sweater covers the chicken’s breast and yet is narrow between the wings as to not restrict wing movement. 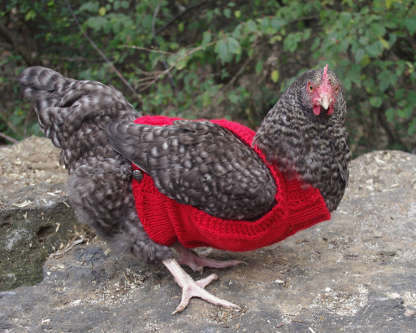 It fits snug at the base so there are no worries about the chicken catching it’s foot in the sweater. Perfect for use when molting during the cold, winter season! Thank you for this pattern! I do not like writing patterns although I am an avid knitter. One of my hens is molting now and I was experimenting with baby tshirts to cover her but she kept getting her foot caught in the front so I was getting ready to design a sweater for her. Thank you for saving me the time! Falcon says thanks too! Thank you for your articles and patterns. 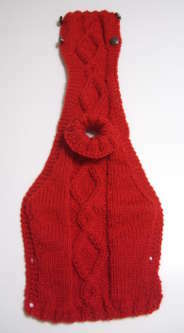 I am a crafter but do basic knitting. Can you suggest a basic pattern for a chicken jumper that would be easy for me to knit. I would love to have a go. Could I use the cabled pattern and just do moss stitch? I hope to someday write one that has a more basic pattern instead of the cable, but I don’t know when that will be. So in the mean time, you can absolutely make this one with a moss stitch in the center, or can even just make it with stockinette in the center. Be sure to use ssk/k2tog or p2tog appropriate to your pattern. Also change the m1 and mp1 stitches appropriate to your pattern. Lastly, I added two stitches throughout the body to compensate for the tightness of the cable stitches. You can eliminate the mp1 stitches on Row 5 and the p2tog stitches on Row 65. Then you will have two less stitches than what I show on Rows 5 to 64. I hope you take this in the spirit of admiration- your chicken is now my profile pic on Facebook. I’m linking to your pattern, in case a friend fancies making sweaters for her birds – thick frost this morning, and it’s late March! I have long wanted to keep hens, but it’s not practical, I’m afraid. Thanks all the same! Noelle, the hen pictured is actually mine. Her name is Willow… just in case you want a name to attach to your profile pic. Love the chicken pattern. My sister’s “3 girls” Ben’s will love them for Christmas. Will be anxious to sign up for Mama’s newsletter or blog.